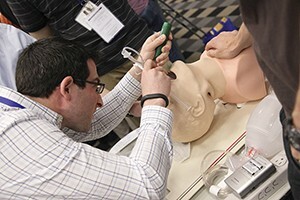 During the ATS Resident Boot Camp, which attracted 140 residents, participants practice hands-on skills. The ATS Fellows Track Symposium, Resident Boot Camp, and Student Scholars Program have become a huge draw for early career professionals, with this year’s attendance at 405, representing a 61 percent increase from last year. So many residents applied for the 70 spots in the Friday and Saturday Resident Boot Camp that the program’s capacity was doubled to 140, to satisfy the demand. “The leadership felt it would not be appropriate to turn them down since one of our missions is to train the next generation of pulmonary care physicians. We doubled the program and added a pediatric track,” says Resident Boot Camp Course Chair and ATS Training Committee Vice Chair Laura Crotty Alexander, MD, assistant clinical professor of medicine at the University of California, San Diego. Now in its second year, the Resident Boot Camp prepares residents who are entering pulmonary, critical care, and sleep fellowships with small breakout sessions and skills-based workshops with 85 faculty members. “We know the best way to teach is in very small groups with this generation of learners, so we minimized the lectures to two hours a day and the other six hours to small group sessions,” Dr. Crotty Alexander says. Planners set aside four hours each day to show the groups how to perform bronchosocopy, intubation, heart and chest ultrasound, spirometry, and mechanical ventilation. “I think this is important for residents because they will not have been exposed to a lot of these things going into fellowship. Our hope is that this will build their confidence for their first day of fellowship,” says Brendan Clark, MD, a member of the Resident Boot Camp Planning Committee and an assistant professor of medicine at the University of Colorado School of Medicine, Aurora. The skills-based learning has been rewarding for April McDonald, MD, a third-year resident at the University of Tennessee, Knoxville. “We’ve been doing ultrasound, bronchoscopy, and all kinds of things that will be pertinent to when we begin [our fellowships]. It gives us a leg up before we get started. It’s been a wonderful opportunity, and I’m thankful to be here,” Dr. McDonald says. This year, 200 fellows took part in the Fellows Track Symposium. Faculty discussed clinical issues related to the diagnosis and treatment of a variety of pulmonary, critical care, and sleep disorders, including sepsis, COPD, lung cancer, asthma, and interventional pulmonology. It also included four breakout sessions and an ultrasonography dinner symposium. Also this year, the Medical Student Scholar Program was renamed the ATS Student Scholars Program to reflect the inclusion of attendees from various professional backgrounds. That program has grown from 31 to 65 attendees, organizers note. Sarah Haeger, an MD/PhD student studying acute lung injury for her thesis project at the University of Colorado, is mindful of the educational benefit, especially the opportunity to talk with her fellow mentor. “I’m excited to talk about how he got into pulmonary and critical care medicine and the path he has taken because I’m interested in pulmonary critical care medicine,” Ms. Haeger says. The Resident Boot Camp is supported by an educational grant from Olympus Corporation of the Americas. In-kind support is provided by Bryan Corporation; FUJIFILM SonoSite, Inc.; Hamilton Medical, Inc.; Micro Direct, Inc.; Olympus Corporation of the Americas; Richard Wolf Medical Instruments Corp.; Smiths Medical; and Verathon. The FTS is supported by educational grants from Actelion Pharmaceuticals US, Inc.; AstraZeneca LP; Boehringer Ingelheim Pharmaceuticals, Inc.; Genentech; and Sunovion Pharmaceuticals, Inc. In-kind support is provided by FUJIFILM SonoSite, Inc.